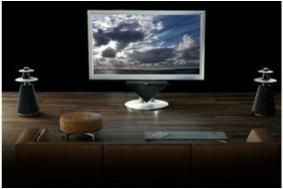 103in TV on the way from Bang & Olufsen | What Hi-Fi? We've been invited to a private webcast launch next week of the BeoVision 4-103, and this is the company's first picture of the TV in situ. At the moment details are thin on the ground - we'll bring you more immediately after the launch event, but it's said that the TV comes complete with a stand able to lift, tilt and rotate the massive screen. Which, given the fact that the only 103in TV we know of – Panasonic's TH-103PF9 plasma display, currently being used in our demonstration room at the Bristol Sound & Vision Show – weighs no less than 220kg, is something of an achievement. Mind you, we did first hear about the set in the massive Cube test chamber at Struer, where the engineers were boasting that the gantry used to position speakers for test could even handle a TV that size, and tilt, rotate and place it with millimetre precision. So perhaps that gantry has been reverse-engineered into a TV stand.